Two local Boy Scout troop leaders are leading the push to rename part of Jackson Highway after the late Stanley Van Vleck, a local legend, rancher and philanthropist. A state legislative measure has been introduced that would post memorial signs at Stone House Road and the Amador County line, renaming that part of Jackson Highway the Stanley L. Van Vleck Memorial Highway. Much of that stretch of the highway runs through the century-old, family owned Van Vleck Ranch on 5,000 acres in Sloughhouse. "It think it's a wonderful tribute to Stan," said Van Vleck's widow, Lynn. "I'm honored that they want to do this." The memorial signs, to be financed by donations, were the brainchild of Ian Anderson and his father Steve Anderson. Steve Anderson is an assistant Scoutmaster for Troop 59 and Troop 118 in Elk Grove. Ian is an Eagle Scout and an assistant Scoutmaster for Troop 59. For at least 40 years, the soft-spoken Van Vleck - a 1937 graduate of Elk Grove High School at age 16 - allowed Boy Scouts free access to 200 acres of his property to conduct activities. Since 1991, Van Vleck let the Andersons' Boy Scout troops use the property for its spring Camporee. He put a water well in solely for the Boy Scouts' use, according to Steve Anderson. Van Vleck also shared his land with 4-H clubs, Future Farmers of America, California Operating Engineers, Girl Scout troops, local students and families who wanted a chance to experience open space. He hosted training for the FBI, the Sacramento sheriff's and police departments, the California Air National Guard and the Department of Forestry. He also allowed the property to be used for a 2,000-person Civil War re-enactment and other activities. "He was generous to a fault," said Steve Anderson, who knew Van Vleck for 11 years. "He was more involved in youth activities than anyone I have ever seen ... I never met a person that was so well-to-do and so down-to-earth. He was quite a character ... I miss the man. I really do miss the man." Stanley Van Vleck died Sept. 7 in a helicopter accident on his ranch at age 79. In the 1940s, Van Vleck spearheaded the creation of the Cosumnes River School District - even though he was not yet married and had no children at the time. He was the district's school board president for many years. 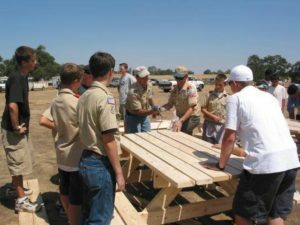 Knowing that many young children were not attending school, he convinced parents to volunteer to help build an elementary school - Cosumnes River Elementary. It became part of the Elk Grove Unified School District in 1959. "That's the way Dad was – it was how strongly he felt about education," said Van Vleck's son, also named Stan. According to the Assembly Concurrent Resolution 4 – the measure to establish the highway memorial - Van Vleck had a "long and distinguished career as a rancher in the Sacramento region." He served in many leadership positions in agricultural organizations at the local, state and national levels, including the National Cattlemen's Association, the California Cattlemen's Association and the California Farm Bureau. Van Vleck also was a pioneer in herding cattle with a helicopter, beginning in 1966. He served on the board of the National Flying Farmers. At age 7, he went on his first cattle drive, a six-day, 90-mile trek to Nevada. Ironically, Van Vleck owns the part of Jackson Highway that is proposed to be named after him, and much of the property on both sides, said the rancher in a September 1999 interview, a year before his death. In 1917, Jackson Highway was nothing more than a wagon trail. Van Vleck said he was never compensated for the land used for the highway. However, he has always paid property taxes on it, his son said. "Dad never made it a big issue," said Stanley Van Vleck Jr. "It was kind of a running joke in the family that we should put a toll booth out there," he added, laughing. The Andersons began their campaign for the memorial signs without knowing that Van Vleck owned part of the highway, Steve Anderson said. After Ian Anderson got the idea of renaming the highway and posting the memorial signs, the Andersons began an e-mail campaign for the legislative act and for donations. About 20 e-mails found their way to Assemblyman Anthony Pescetti's personal e-mail. Pescetti is sponsoring ACR 4, which will begin being heard in committees in February. As of Monday, the Andersons had collected $800 for the memorial signs. Donations can be sent to Boy Scout Troop 118, 8184 Finmere Way, Sacramento, CA 95829. "He really loved the Boy Scouts," said Stanley Van Vleck Jr. "It's a real nice honor they are paying to Dad. It will be nice for future generations to see it ... to know it's OK to open up to your community and play a role."